Fundamentally the rally in the broad stockmarket from early in March is viewed as being the result of a combination of media hype, wishful thinking and short covering, but there may be more to it than that - it would appear that a sizeable proportion of the TARP (Troubled Asset Relief Program) funds not thus far deployed have been used to drive up the stockmarkets in order to create a positive environment for the banks to issue secondary shares and thus raise equity. While this is perfectly understandable, it also means that once the banks have finished selling this stock to the public, or the market is simply exhausted by being soaked in this way, it is likely to go into reverse in a big way. Technically, the rally in the broad stockmarket looks to be over and there are several important reasons to conclude that this is the case. On the 1-year chart for the S&P500 index we can see that despite the impressive gains, all the market has managed to do is rally from an extremely oversold position to approach its falling 200-day moving average, and so there is no reason thus far to consider that it is anything other than a typical bearmarket rally, albeit a big one. 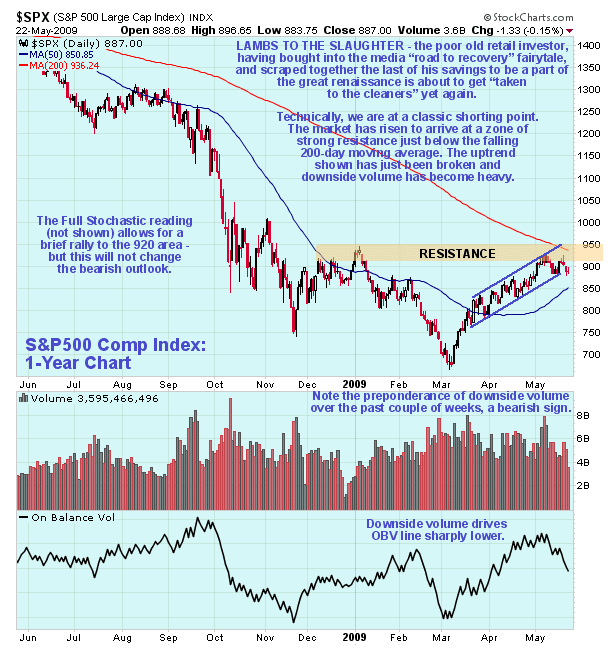 The rally stalled out a couple of weeks ago in the important zone of resistance shown and the index has since been retreating beneath the 200-day moving average, and late last week it started to break down from the uptrend in force from mid-March, a bearish development. On the 6-month chart we can examine recent action in more detail. On this chart we can see that the breakdown from the uptrend occurred on Thursday, although thus far the break is not big enough to be conclusive, so we could yet see a short-term rally back towards the 920 area, especially as the fast stochastic (not shown) has dropped back to provide the leeway for such a move. However, the trendline break still has bearish implications that are definitely amplified by the growing preponderance of downside volume over the past couple of weeks, as shown by the red volume bars at the bottom of the chart, which has led to the first significant drop in the On-balance Volume line since the uptrend started, another negative sign. In addition a bearish "shooting star" candlestick appeared on Wednesday, when the market attempted to the challenge the early May highs and failed, dropping back to close near the day's low. A top area appears to be forming between the rising 50-day and falling 200-day moving averages, which are rapidly converging. This top area is bounded by the resistance shown and a support level which has become evident in the 880 area, breakdown below which would likely trigger a steep decline. The abnormal and surreal nature of the recent rally is made starkly clear by the small charts below, prepared by www.chartoftheday.com. Both of these charts go way back to the 1930's and the first of them shows the extraordinary collapse in earnings of the S&P500 companies. The second of them shows that the resulting overall P/E ratio has risen into the stratosphere. These charts are most interesting as they demonstrate that earnings no longer matter to investors - all it takes to make the market go up these days is hope, TV commentators talking the market up - and a big dollop of TARP money. This is what is commonly known as a disconnect from reality. One thing is for sure - you don't want to be around when the market suddenly realizes that Barack Obama is not going to be able to wave a magic wand and make everything right, even with the benefit of creating trillions of dollars out of thin air to bid everything up. All this manufactured money had better create a recovery soon or the market is likely to implode. However, recovery is unlikely for, as we know, the banks are jealously hoarding their government granted largesse, and even if they made the funds available to the wider world, companies and individuals are so lamed by debt and fearful that they are in no mood to borrow, no matter how low the interest rate. So let's put 2 and 2 together - the stockmarket rallies hugely to discount recovery, but the recovery never materialises. Well, what a shame - it's an awful long way down from here. Some market observers have been making comments in the recent past to the effect that leveraged ETFs are a scam designed to sluice money from retail investors into the pockets of professionals. While we would concur with this it shouldn't really be surprising, as to the extent that they are a scam they are simply following the rich tradition of many Wall St financial instruments, and compared to sub-prime mortgages, for example, they are a "mom and pop" operation as many European banks and financial institutions still smarting from immense losses will attest. This is not to say that you can't make good money out of them at times - in the same way that an experienced gambler may enter a casino in Las Vegas with a fair chance of coming out richer, but knowing that whatever his fortunes, the house will always win. Right now there are some bear ETFs which have been driven down almost to zero by the big market rally that look set to do really well if the market heads south soon as expected, even taking into account the eroding time value of option elements comprising them and the suspected tendency of the management of these funds to use them as ATMs. On www.clivemaund.com we will be looking very soon at the associated effect on the dollar and the Treasury market of a reversal in the broad market and also at the likely impact of all this on prices of Precious Metals and oil and on resource stocks. We called the big rally in copper back in February before it began, and called the big rally in oil almost at its inception, and then more recently for copper to enter a trading range and oil to continue higher, which is what happened, and finally called the latest rally in gold and silver, although they were expected to perform better than they have on the recent dollar weakness. A big issue that we will address soon is whether gold and silver can break out shortly to new highs or whether they will get caught up in another downwave of deleveraging. © 2009 Clive Maund - The above represents the opinion and analysis of Mr. Maund, based on data available to him, at the time of writing. Mr. Maunds opinions are his own, and are not a recommendation or an offer to buy or sell securities. No responsibility can be accepted for losses that may result as a consequence of trading on the basis of this analysis. Mr. Maund is an independent analyst who receives no compensation of any kind from any groups, individuals or corporations mentioned in his reports. As trading and investing in any financial markets may involve serious risk of loss, Mr. Maund recommends that you consult with a qualified investment advisor, one licensed by appropriate regulatory agencies in your legal jurisdiction and do your own due diligence and research when making any kind of a transaction with financial ramifications. This dude was saying the same bearish tuff at S&P 666 - that was 41% ago! !